These are not an overly sweet cupcake and perfect for a special occasion. 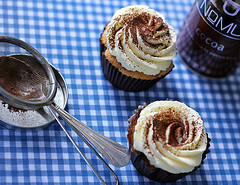 Recipe for Tiramisu Cake, Filling and Whipped Toppings. In a large bowl, gently whisk egg whites, egg, oil, buttermilk, sour cream and vanilla. Filling: Combine all ingredients in a small bowl using a spoon. Topping: Using a whisk attachment on your stand mixer, beat cream cheese and powdered sugar until smooth. Add vanilla. Slowly add in heavy cream and beat until stiff peaks form. To assemble, cut a cone shaped piece of cake out the top of each cupcake (make sure cakes are cooled). Generously spoon in your filling. Pipe your whipped topping over the hole with the filling and top with chocolate shavings and cocoa powder. Notes *For strong coffee, mixed about 1/3 cup boiling water with 4-5 teaspoons instant coffee. Then measure your coffee from that. Adjust recipe using more or less coffee depending on how much you like the flavour of it. Read Reviews and Compare Bakeware sets .